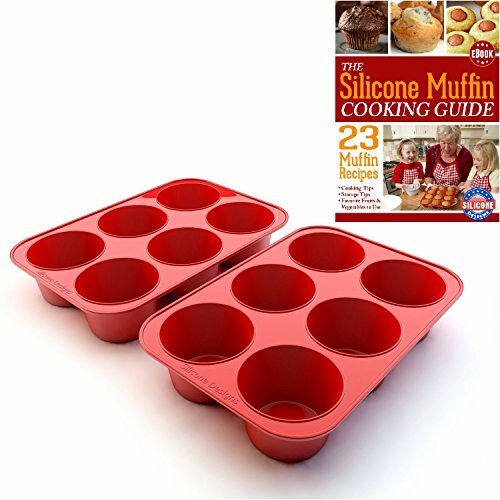 Non-Stick - Muffins Pop Right Out! Free Lifetime Warranty with Registration WHEN purchased NEW and purchased from ONLY Authorized Seller on Amazon: Amazing Light Inc.
Eat Healthy! Feel Better! Live Longer! SET of 2 - SIZE: 11 x 7.5 inches (each). Cup diameter top = 3 inches. Cup depth = 2 inches. FAMILY SAFE *** SIMPLE TO USE *** EASY TO CLEAN - BPA-free. FDA Approved. Dishwasher safe. Microwave safe. Freezer safe. Oven safe to 470F. If you have any questions about this product by Silicone Designs, contact us by completing and submitting the form below. If you are looking for a specif part number, please include it with your message.